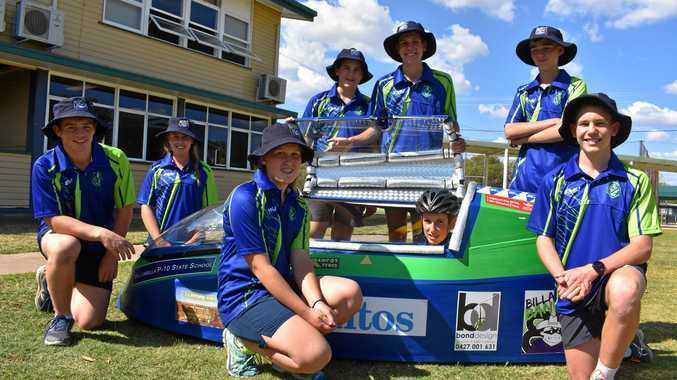 WALLUMBILLA State School students will compete this weekend at the Fraser Coast Technology Challenge in a feast of pedal- powered perseverance. In the ultimate test of endurance, eight students from Years 9 and 10 will be required to take turns to power the racer for an imposing 24 hours around the streets of Maryborough. Principal Melissa Graham said the race would bear similarities to an elite grand prix event in the likes of the Le-Mans 24-hour. "The racers will have a pit lane, pit crew and they're racing non-stop so it's just like a Formula 1 race,” she said. The race aims to develop the students' skills in key areas while building on the school's industrial design faculty, Ms Graham said. "The goal of the race is to develop our design and technology curriculum around it and also help create those soft skills like teamwork while also generating creative thinking,” she said. "It's about students solving problems they will encounter with their race vehicle and how they can solve those problems. As part of the entry requirements, students were responsible for sourcing their own vehicle, ensuring it was roadworthy and met the strict criteria set out by the race organisers. Thomas York said the group ran into some roadblocks when building the racer. "We had a lot of problems with the glue - it wouldn't stick properly,” he said. Each competitor was required to pass an online examination to acquire their human-powered vehicle license. Ms Graham said the students worked hard to prepare for the race, which included having to source their own sponsorship. "Students needed to scope out where to purchase a vehicle so they looked at pros and cons of costs associated when looking to buy,” she said. Santos, through its community engagement plan, provided funding for the project, while Mitre 10 and Bond Design also made valuable contributions through resources and graphic design.